Huawei introduced hardware acceleration feature called GPU Turbo that optimizes system utilization for heavy usage like games. The fellow Chinese manufacturer Oppo decided to follow suit and scheduled an event for October 11 in Shanghai called Hyper Boost Tech Meeting, according to an invite sent out to Chinese media. 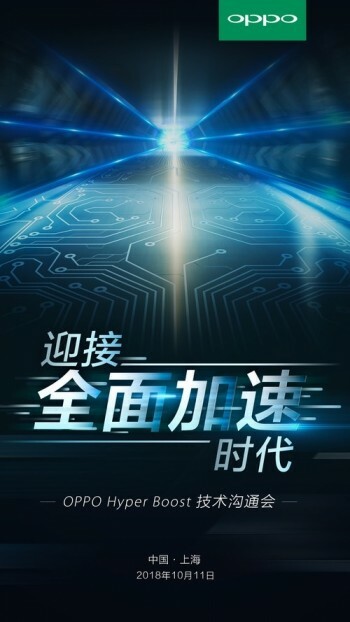 The poster contains a teaser, saying “Towards an era of acceleration”, suggesting it will indeed be a feature that will boost GPU and/or CPU performance. Since the launch is just a day after the official announcement of the Oppo K1, sources suggest the two might be linked. This means the new phone could be introduced as gaming smartphone instead of a middle ground between Oppo F9 and Oppo R17.